I always think I have a billion decorations for every holiday and then when we actually bring them out of storage every year, I always realize that I want more. Such was the case when we unearthed the dusty box of Christmas decor this year. We haven't purchased our tree yet, so perhaps that's why I feel our home is decorated enough just yet. A few years ago I developed the most heinous allergies and I'm still not sure if pine is one of them. Any day now we're going to have to finally make a decision between a real tree like the kind I grew up decorating every year, or purchasing our first faux tree. But that's another post for another day. 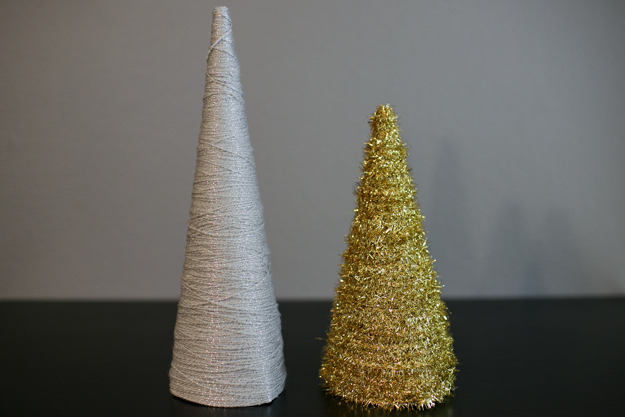 In the meantime, I thought it would be fun to do some Christmas decor crafting and ironically, I found the most adorable mini Christmas tree crafts on Pinterest, the source of all modern craft creativity. The Christmas decor in our home has a very specific theme (I like to call it a winter wonderland style), so I was pretty selective when it came to color and material. I chose three different styles of trees and tried to keep with a metallic colored theme. We all know how much I love the color gold, so you know I had to include that in there somehow! Here's what Jeff and I ended up with while crafting our mini trees over the weekend, starting with the first 2 types of trees. 1. 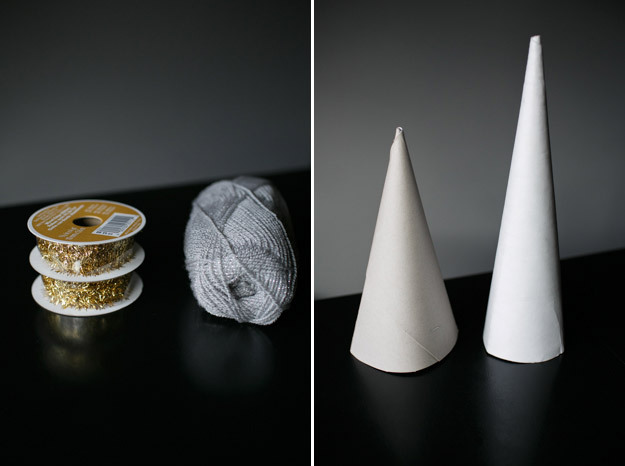 Create a cone shape in whatever size you desire using the cardboard type material you've chosen. Where possible, make sure the side with the label (if applicable) is on the inside of the cone so you can't see it. 2. Once you've formed your cardboard into the size and shape you want, secure it with a glue gun. I also used a stapler at one point because it seemed rational. Whatever works for you, just as long as it's secure and not too bulky! 3. Select the material you want to use (tinsel, yarn, etc.) and starting at the base of the cone, secure the material with a glue gun. Then begin wrapping the material around the cone, being careful to make sure the cardboard surface is covered as you go. If you don't quite cover all of it, that's okay. You can go over it later. But the better you cover it in the beginning, the easier your life will be. 4. Use the glue gun every so often to make sure the material your using is secure, especially towards the tip of the cone where it becomes much more narrow. 5. There isn't a perfect way to cover the tip of the cone, so use your imagination on this one. With the yarn tree, I ended up cutting the yarn strand just slightly longer than the top of the tree, using the glue gun on the very top and lightly pushing it through. 6. If needed, use more material to cover the spots you might have missed and pay special attention to the base of the tree. The 3rd type of tree was the easiest to make, providing you have the right materials. 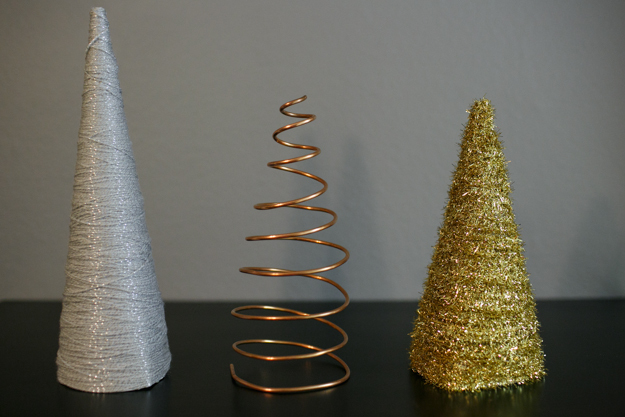 We initially used wire from the jewelry making section of the craft store, but after shaping it into the tree shape, we realized it was too flimsy. So we headed to Home Depot and picked up 6 ft of copper wire. We ended up having to cut off about 1/2 a foot of it at the end, but it all depends on how wide and how tall you want your tree. In the original tutorial I saw of this tree, they used a foam cone to shape it. 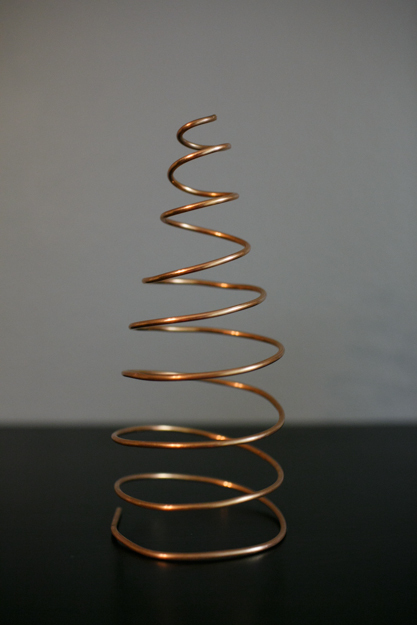 Jeff assured me he'd be able to use one of our cardboard cones to shape it, but soon realized the copper wire was too strong for the cardboard. So he ended up using odds and ends around the house, including a Martinelli's bottle from Thanksgiving. I like that it's minimal, but still festive!